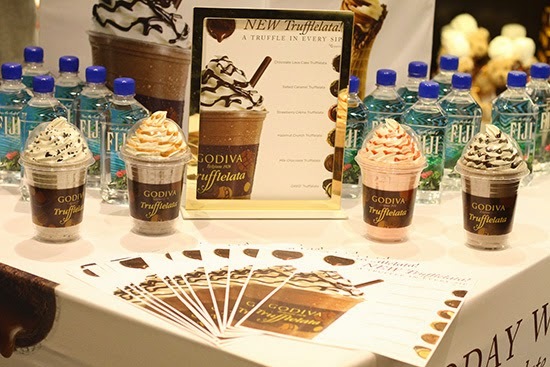 A few weeks ago, I attended a small tasting event at GODIVA in honor of their latest masterpieces: the Trufflelata shakes and Soft-Serve. 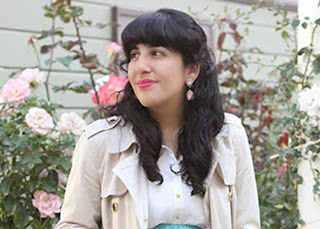 I had Armando (willingly) join me to try out the shakes and soft serve and we hung out with my fellow blogger friends +Chelsea Pearl (ChelseaPearl) and +Jennifer Henry-Novich (Just Add Glam). The Trufflelata milkshakes earn their namesake by having actual chocolate truffles blended into the shake. It's like eating a truffle with every sip. I was really excited to be tasting all 6 of the flavors they currently have available. First, we started out with a sample of the Chocolate Lava Trufflelata. We then went down the list and tried Salted Caramel, Strawberry Creme, Hazelnut Crunch, Milk Chocolate and ended the the Trufflelata tastings with the Oreo truffle. It was definitely hard to pick a favorite, but mine would be a tie between the Hazelnut Crunch and Salted Caramel Trufflelatas. Armando really enjoyed the Oreo Trufflelata. 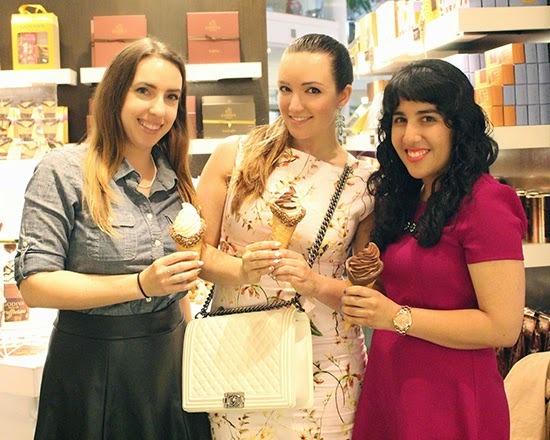 After we finished the Trufflelata samples, we began sampling the 3 soft serve flavors. First up was the White Chocolate Vanilla Bean, where you could smell the yummy Madagascar vanilla. Next was the Dark Chocolate, which reminded me of a cross between fudge and pudding. The soft serve is thick, which was a nice surprise for me and Armando. 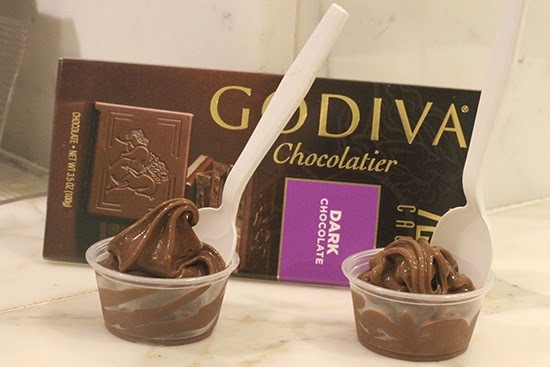 We both enjoy a good soft serve treat and will grab one from Burger King or Dairy Queen every now and then, but GODIVA soft serve is truly decadent. We both loved the Swirl flavor because you get the best of both worlds. 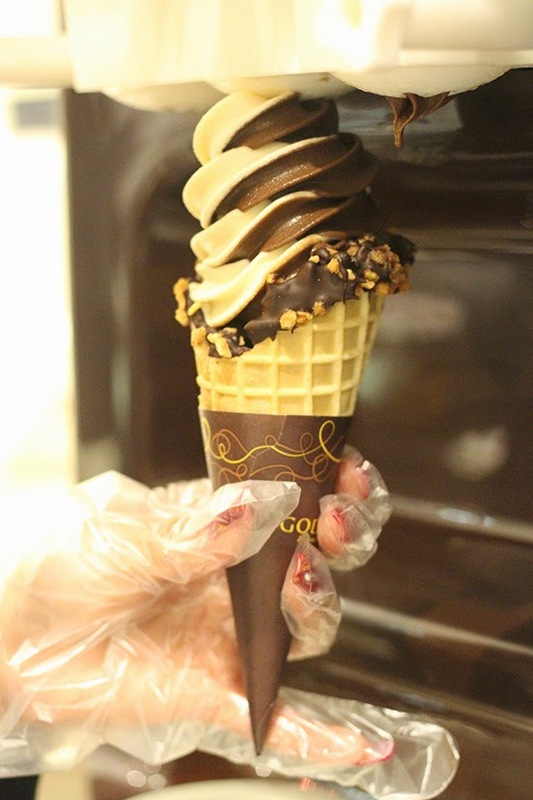 After our tasting, we all had the chance to order a complimentary shake or soft serve cone. Most of the attendees opted to go with the cones, and Armando and I requested a full-size version of the Swirl on a praline nut chocolate dipped waffle cone. The result of the soft serve with the waffle cone was truly decadent, and my sweet tooth was completely satisfied. 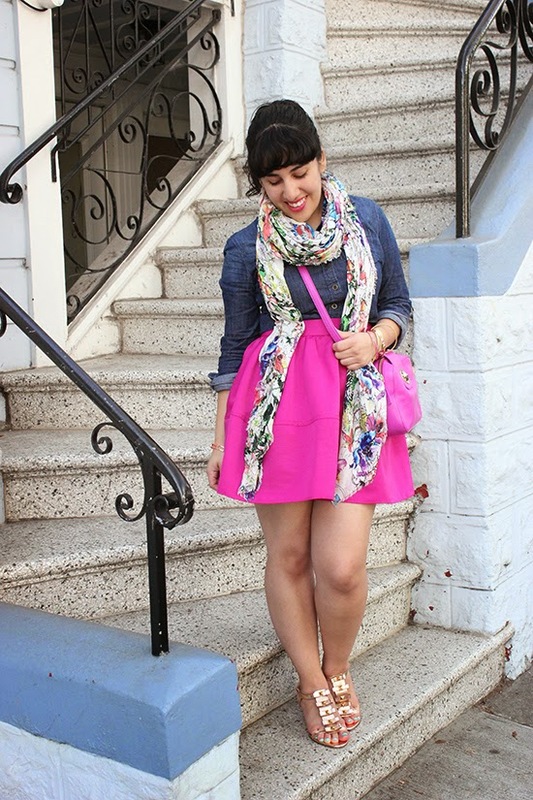 Now while I got to stuff my face with yummy treats, it doesn't mean you can't do the same! 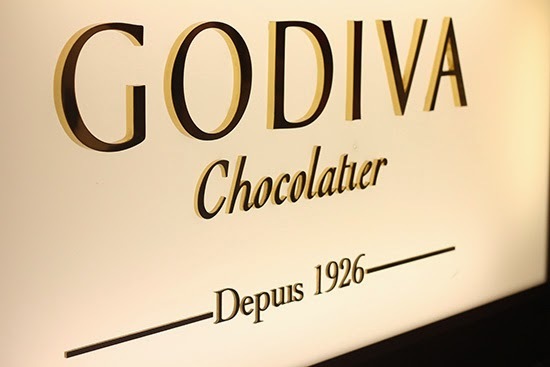 GODIVA hosts Happy Hour at participating boutiques on Weekdays from 3PM - 7 PM where you can buy either a GODIVA Trufflelata or Soft Serve and get the second one 50% off. While you enjoy your treat, post a photo of your GODIVA summer fling with #GODIVASweeps to enter for a chance to win a year of GODIVA! (More info here.) The contest ends September 1, 2014 so hurry on over to a GODIVA nearest to you and get to snapping. 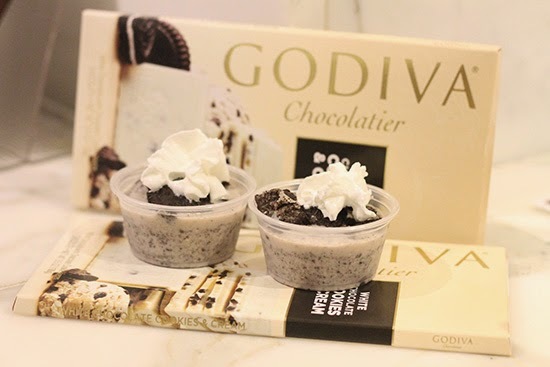 And, as if you can ever get enough chocolate or freebies, check out Just Add Glam's GODIVA giveaway for a chance to win 1 of 5 $25 GODIVA gift cards.